When I was about Kaylee’s age, I visited my Great Grandma Lola’s house. It was an old house, full of dark wood, fancy furniture, and large, ornate central heating grates. Great Grandma let me play with her miniature china teacups while the grownups talked. And even though she warned me not to, I accidentally dropped one through a hole in the grate, never to be seen again. I honestly don’t remember if I got into trouble, but I do remember the terror I felt at having to confess my crime. That incident was the inspiration for this story. An earlier version of this story was published in Creative Connections (2009). Summer was the bestest time of year. Kaylee loved lying in warm grass, looking for cloud pictures. She loved running through the sprinkler. The ice-cream truck came every day. But the bestest part of summer was going to Grandma’s house. Grandma’s house smelled like wood and lemons. It had sunny rooms and dark corners. Kaylee could play mega-hide-and-seek with her big sister, Alyssa. They could spend whole afternoons in the attic, dressing up in Grandma’s old clothes. But the bestest part of Grandma’s house was looking at Grandma’s teacups. Grandma’s teacups were older than Grandma. Pink flowers danced on their thin, white sides. If fairies had tea parties, they’d use teacups just like Grandma’s. “How come I don’t get a teacup?” cried Kaylee, who always used a plastic mug. This summer would be different. Alyssa was going to soccer camp. If Kaylee was big enough to visit Grandma’s house by herself, she must be big enough for Grandma’s teacups. Kaylee spent a whole week at Grandma’s. She caught pollywogs in the pond. She threw water balloons at the kids next door. She played dress-up without losing any buttons. But every afternoon, Grandma and Kaylee drank milk from plastic mugs. On Kaylee’s last day, fat raindrops fell. It was too cold to splash in puddles. It was too dark for dress-up. The kids next door weren’t home. “I’m not big enough for anything!” Kaylee stomped out of the kitchen and into the dining room. Grandma’s teacups were in the china cabinet. Quietly, quietly, Kaylee dragged a chair over to the cabinet. She clambered up. She opened the door. She reached for one of Grandma’s teacups. The chair slipped. Kaylee grabbed the cabinet door. She didn’t fall. It crashed onto the dark wood floor and broke into a million jillion pieces. Kaylee froze, listening. Quickly, quickly, she closed the cabinet door, replaced the chair, and stuffed the shards of Grandma’s teacup under the rug. “There you are, Cinnamon Heart.” Grandma wiped her hands on a tea towel. “Since it’s your last day, let’s have a big-girl tea party. With cinnamon buns. 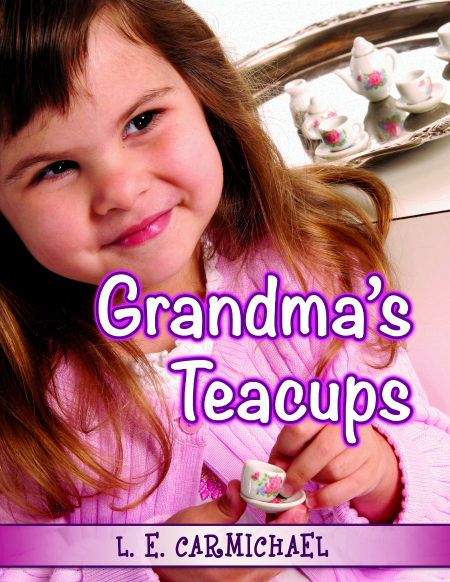 And real teacups.” Grandma smiled and went back to the kitchen. Kaylee’s lip wobbled. She ran to find her craft glue. Kaylee liked jigsaw puzzles, but this one was hard. No matter how she moved the pieces, they didn’t fit right. And the glue wouldn’t stick! She got glue on her shirt and glue in her hair. The glue on the teacup was lumpy and bumpy. It covered the pretty pink flowers with crusty white glop, but it wouldn’t hold the pieces together. Kaylee gulped. She gathered the pieces of Grandma’s teacup. She crept into the kitchen. Slowly, slowly, she held out her hands. Kaylee had to go to bed early, but she didn’t mind. She didn’t even mind not eating any cinnamon buns. Maybe being big isn’t about what you get, she thought. Maybe it’s about what you do.